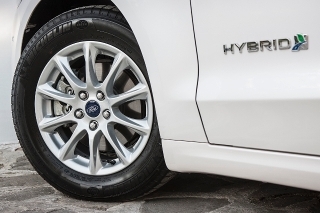 Press the start button in the Mondeo Hybrid and something unusual happens – it’s silent. 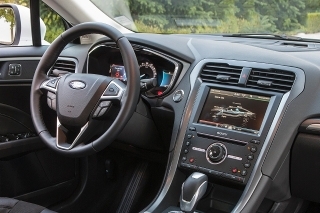 We’ve become so used to Ford’s fleet stalwart rumbling into life with the clatter of a cold diesel engine that the silence of an electric drive almost seems incongruous. It’s rather nice, too. This won’t make diesel Mondeos obsolete, but it’s an interesting proposition. Fuel economy of 67.3mpg with CO2 emissions at 99g/km are both respectable in this segment, particularly with 185bhp on tap. Pricing matches the equivalent diesel-automatic hatchback, which means Benefit in Kind is cheaper than the automatic and manual diesels over three years. The tough job is stacking up in the real world in a segment where diesel is the default choice. 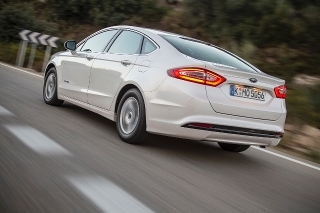 Electrification is joining the Mondeo range almost as an offshoot of Ford’s ‘world car’ plans. So this is essentially the same saloon sold in North America as the Fusion, a market where diesel penetration is tiny and hybrids hold up the economy-focused end of the sector. Ford hasn’t brought the plug-in version to Europe, but clearly it sees space for a petrol-hybrid in the range. It isn’t just a rebadged Fusion, though. 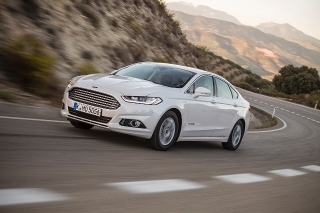 Mondeo Hybrids are built in Europe and, in line with market requirements, there’s a 2.0-litre petrol engine in place of the Fusion’s 2.5-litre. But the rest is almost the same, with a continuously variable transmission and two electric motors – one to lessen the load on the petrol engine, and the other working as a generator, charging its large lithium-ion battery. While it might sound like false praise, this is more impressive than it sounds. The handover between electric and petrol power is seamless, and the latter makes barely more than a whirr when driven gently. Soft suspension, small wheels and a noticeable lack of wind and road noise – doubly impressive with such a quiet drivetrain – make it an exceptionally relaxed long-distance car. Hybrids tend to offer their best economy in town, and that’s reflected by the 100.9mpg urban figure achieved by the Mondeo, but this isn’t a city car. 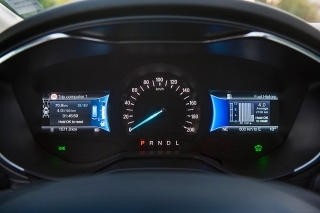 It can drive on electricity at up to 85mph, and gentle use of the throttle results in the petrol engine switching off regularly on the motorway, while screens either side of the speedometer coach economical driving. Brake gently to put power back into the battery, keep the power bar within the white box to avoid burning fuel, and it’ll reward you with economy in the mid to high 50s without much effort. 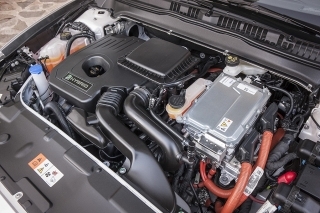 However, it’s economy achieved by sacrificing the eager performance of a diesel engine. This delivers its power in yawns, accompanied by a dull drone from the engine as the transmission ups the revs for extra kilowatts. It’s not a pleasant car to drive quickly, but that’s not the point. The Mondeo is so ubiquitous in fleet that it’s an entirely known quantity, which makes the hybrid a refreshing proposition. It’s not a car for lead-footed diesel drivers, but it’s one of the segment’s most refined long-distance cruisers short of a premium badge, and genuinely fuel efficient with it. Features which make some gentle-footed cruising very worthwhile. A brave move on Ford’s part considering even Toyota doesn’t offer a hybrid version of the Avensis, but the Mondeo Hybrid can hold its own. It’s just a shame it isn’t offered with a broader choice of trim levels and bodystyles to broaden its appeal.